This vintage-inspired save the date card is digitally printed on vellum stock and resembles a blackboard with your wording written in white chalk. 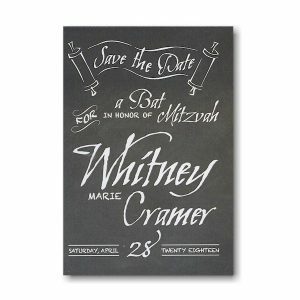 This vintage-inspired save the date card is digitally printed on vellum stock and resembles a blackboard with your wording written in white chalk. Measures 3-1/2″ wide by 4-7/8″ high. Available with the lettering styles as shown. This save the date card comes with single bright white envelopes.